See also: my articles on specific recommendations and menus of restaurants known to be opening in Bruges on New Year’s Eve, and more general information on New Year’s Eve in Belgium. When to book- start looking at hotels and travel by September, although some places advertise rooms as early as April. Minimum cost– assuming two adults Hostels cost approx €50 (2015), bottle of Cava €3 from CarreFour (probably more in local shops if you don’t have a car), fast food dinner €20, evening entertainment free, breakfast €20… total approx €100 plus travel for one night. Recommended place-Het Zand (shortened to ‘t Zand) for huge crowds, sing-along music and fireworks (see map in main article). Recommended arrival time- 9.30pm if you want to be at the front, 10.30-11pm if you want to be part of the crowd. Key info- restaurants need to be booked in advance. Family friendly.Very busy but safe. New Year’s (or Sint Sylvester Vooranvond as the locals call it) is great in Bruges. Here’s a write up of my experience and tips so you can have a great time too! In the lead up to Christmas there’s a big Christmas market in Bruges, which takes over all of the shops and squares in the city centre and goes on right up until 31st December. There’s also usually an ice sculpture display just by the train station and ice skating in Grote Markt by the Belfry. A LOT of people travel to Bruges for Christmas and New Year so don’t go expecting a nice quiet little city break! Start looking at booking your hotel in September, or earlier if you want somewhere specific. We’re going for 2015/16 and booked back in May, although most places haven’t released dates for booking yet and the hotelier did comment on how early we were! But it’ll be my 30th birthday and we wanted somewhere specific so e-mailed ahead to get it booked. If you’re travelling by Eurotunnel you can book 9 months in advance typically, but again you want to be starting to look around September as they do get booked up early and prices go sky high! I would *strongly* recommend crossing the channel on the eurotunnel if you’re travelling from the UK as we do- fantastic service, really easy and we had one *very* bad experience one return journey on the ferry in early January when the weather was really bad, we had to queue for hours to get on and then the crossing was really rough. We had very nearly got on to the ferry which left before ours and apparently that was stranded in the sea for five hours because Dover had closed! Restaurants are open as usual between Christmas and New Year, but need booking in advance for New Year’s Eve. Most restaurants will have a strict set menu for the evening- they want to keep it as smooth as possible for the poor serving and kitchen staff who have to work! Start looking at menus online early December to decide where you want to go- or earlier if you want to go somewhere more “exclusive”. Some restaurants take you right through the evening and into the New Year, but others will chuck you out early- so make sure you know what you’re booking. Look out for hefty prices too- you should expect to pay double what you’d normally expect. As for bars, some close early, some don’t serve food, or some are just completely closed so ask if you hope to eat somewhere. Bruges is host to a huge Christmas market throughout December which is beautiful but nothing extraordinary as far as Christmas markets go. On Grotemarkt there is also ice skating. Shops all take on Christmassy displays which tourists slow right down to gaze at. Bruges is really REALLY busy at this time of year and there is no getting away from the crowds until evening. Everywhere from restaurants to trees to bridges seem to be decorated in fairy lights, and walking along the canals if you’re lucky enough to get a mild evening is just magical. There is also an ice sculptures exhibit in the square outside the train station which tends to have a family-oriented theme. This is pretty pricey to get into but is probably worth it. Keep your eyes peeled for discount vouchers in booklets etc, it’s the sort of place you never need to pay full price. We went one lunchtime to a massive queue and were put off, then returned early evening to no queue at all. At peak times expect to queue for up to an hour. It was still pretty busy inside when we went much later and I can’t begin to imagine whether it would have been worth it had it been even busier. It stays open until 7pm so it’s worth waiting until the crowds die down for a proper look. There’s an ice bar in there too. It’s also worth noting the Ice Sculptures open on New Year’s day too. Attractions and museums are generally open as normal every day after Christmas including New Year’s Eve, although they often close a couple of hours early. We got a City Pass on our first visit to Bruges which meant we could visit a lot of the attractions for a one-off payment- but do be careful if you buy more than 24 hours: the days have to be consecutive, even if your second day is New Year’s Day when a lot of places are closed. Plan where you’re going to eat on New Year’s Eve in advance, as restaurants book up early and put prices up dramatically. We chose to eat a big lunch at 2pm in the Halve Maan Brewery restaurant after a tour, then just had street food on the evening- street food is definitely “where it’s at” for a price-savvy tourist on New Year’s Eve. Most Belgian cities have some sort of public party on New Year’s Eve and Bruges is by no means an exception! The main celebration occurs in ‘t Zand, a large square not far from the train station. To get to ‘t Zand from the Belfry in Grote Markt, face away from the Belfry and take the road to your left: Steenstraat. This is a major shopping street during the day. Then you basically just keep going, past the lovely Simon Stevinplein and Sint Salvatorskathedraal on your left, the road changing into Zuidzandstraat (literally South Zand street), and you’re there- Het Zand. The square isn’t much to look at on a normal day, but does host weekly markets as well as a huge fleamarket in summer months. It is, however, the largest square in Bruges which is why it gets the honour of hosting the New Year celebrations. This is advertised as a giant karaoke event, and you can pick up lyrics in bars, hotels and the tourist information office some time during the early evening. In reality, this is a huge stage on which performers sing well known songs in English and Dutch, and the audience are encouraged to sing along. In other words, don’t worry, you’re not going to be invited on stage! It gets pretty packed: think 18,000 people plus but everyone is friendly and crime in Bruges is low. It’s still probably worth leaving your phone and cash in the hotel room as you never know who’s next to you wherever you go. The main event is advertised at starting at about 10-10.30pm. Some people arrive earlier and mill around in small groups with bottles of bubbly, most Belgians don’t turn up until 11.30pm or later. When we’ve been, we got to the local area at around 9.30pm and checked out the small bars which line the square. They’re not the nicest of bars but do offer warmth, drinks and a loo! Beware though, a lot of them will charge for the toilet (even for customers drinking and eating with them!) on New Year’s Eve. The first one we came across I was *bursting* for the loo but was so outraged by the charge I refused, moving on to the next bar, and the next, until a mile’s walk and an hour later I gave in and paid the 50 cents for the privilege which I could have done at the first place haha. I think it’s just a necessary evil- and fair enough considering how busy it gets. It may seem like a waste if you’re penny pinching as we were at the time, but how many times are you going to wee during that one evening really? Probably more if it’s on your mind so don’t get bothered by it like I did! So into the crowd you go. I can’t really recommend a particular place to stand, other than to say the further into the crowd the better! If you want to be anywhere near the front you need to arrive early, around 9.30-10pm. In my opinion being mid-crowd has a better atmosphere. No matter how much space you have when you first arrive, you WILL get packed in! In my opinion it doesn’t really matter where you are in the crowd or how much you can see- I’m a shorty so am used to seeing very little at these sorts of things. The atmosphere is great and if you bag a lyrics booklet you’ll have a great time singing along with the random French bloke next to you. You do get silly people doing silly things like trying to light Chinese lanterns and let them go- never a good idea in crowded places! But those people soon realise that there’s really no point, they’re not getting anywhere and all they’re doing is causing a hazard- so don’t buy them and don’t try to let them off. There are no laws against drinking in public places in Belgium, so it’s perfectly acceptable to bring a couple of bottles of something fizzy to share with your friends, family and new friends on New Year’s Eve. We make a habit of frequenting the local CarreFour supermarket to stock up on beer whenever we’re in Belgium, and a perfectly adequate bottle of some sort of Cava-style fizz can be picked up for a couple of Euros (although we are by no means wine connoisseurs, but if you’re more choosey than us then you’ll know what you’re looking for). Most people will have some drink with them, and many will be willing to share we’ve found! By midnight it feels like the whole city has invited everyone they’ve ever met to t’Zand and the countdown starts. It’s a brilliant atmosphere to share New Year wishes with people in all different languages and different lifestyles. There’s a massive fireworks display which goes on for 20 minutes or so, and families start to leave pretty much straight away. Don’t worry though, the karaoke carries on and the music and partying goes on well in Nieuwjaarsdag (New Year’s Day)- think 2-3am, and even then there are bars which stay open until breakfast. This won’t be advertised, it’s something you just have to stumble upon I’m afraid. It probably depends on what sort of atmosphere they have, what sort of mood the owner’s in and how intoxicated they really are. Even the walk home is great- whether you leave at 12.15 or 2.15, there’ll be loads of people around wishing you happy new year, singing, cheering and generally having a good time. Beware of people letting off fireworks in the street, something we’ve come across in a few Belgian cities on NYE. There always seems to be one or two people doing it, and they seem to have little consideration for others around them. If you hear random fireworks going off, just stay away. I have always felt 100% safe in Bruges, no matter how crowded it is, but being used to the strict rules surrounding fireworks in the UK they do scare me. Most big shops are closed on Nieuwjaarsdag, but there are always a few touristy shops and cafes open. Museums are shut; bars and restaurants are not. The same goes for 2nd January too unless it’s a Saturday- some places may even stay closed until the following weekend. But after a big night out the night before, it’s the perfect day to just aimlessly wander the streets of Bruges, sipping a beer in whichever open bar you find and having a coffee and waffle. A lot of the tourists seem to leave immediately on 1st January, as the city seems completely dead… or maybe it just feels that way in comparison to the huge crowds of the night before. Once the weekend is over everywhere returns to normal, but it’s worth checking which places are open on 1st and 2nd January if you have to leave soon, otherwise you may end up missing out on that lovely restaurant you’d decided to go to on your last night. There are lots of things to do in Bruges throughout the year- here are a selection of things unique to the summer season that are waiting for you to try! On the second weekend of July, Minnewaterpark is taken over by a variety of international music groups for three days of live music from a mix of genres. Past acts have included Mogwai, Kate Bush and KT Tunstall as well as local performers. Tickets in 2015 cost 55 euros for one day, with an extra 13 euros if you want to camp at a venue just over a mile away with buses running between the campsite and festival. As the venue is fairly small for a festival, there is only one stage- meaning no overlaps! But at the same time if you don’t like what’s on stage there are stalls, food as well as local acts playing just for the honour of getting their music out there. 15th August is a Bank Holiday in Belgium, celebrating the Catholic holiday Assumption Day: commemorating the Virgin Mary’s assumption into heaven. In Bruges every year the Brugse Belofte procession (translated as Bruges’ Promise). This has happened every year for over 700 years. The procession features actors portraying different religious scenes, and a special candle which is carried from Our Lady of Blindekenskapel at 9.30am through t’Zand,Vlamingstraat, Jan vanEyckplein to the Lady of Our Potterie Church, arriving there at 11am. There is then a church service before the procession returns back the same route. Short for the Musica Antiqua festival and part of the annual Festival of Flanders, the MAfestival is a celebration of ancient music which has been running for over 50 years. Each year the ten-day festival features attractions including both free and paid concerts, master classes, conferences, exhibitions and competitions. For the last couple of years, a particular highlight of the MAfestival has been the Velo Baroque, which takes place on one Sunday (2015 date was 9th August, the concluding day of the festival).Velo Baroque is a 30 kilometer (18.5 miles) round-trip bike ride starting from Bruges and following a trail to Damme, Meetkerke and Zuienkerke through wetland and woodland to watch various muisc concerts at different venues along the way. In 2015 the MAfestival runs from 31st July until 9th August, with annual dates being around the same time each year. The epicenter of the festival is t’Zand Concert Hall. Triennial Bruges is a Contemporary Art and Architecture exhibition event, brought back to Bruges for the first time since 1974 in 2015, with aspirations to establish it as an annual event. The broad idea is that a concept is selected, and a variety of indoor and outdoor venues are taken over with different peoples’ explorations of the concept. Find a nice bar, order a beer, sit back and watch the world go by. Bustling Bruges, with it’s 5 million plus annual tourists, is the perfect place to relax and take in your beautiful surroundings. And the summer time is the perfect time of year to do this, when the weather’s warm enough to sit outside- but not too hot to really relax as in other worldwide cities. With Belgium’s perfect selection of homegrown beers too you can’t find a better location. Order some “tapas” nibbles from the menu if you’re feeling peckish: go local and enjoy some cheese with mustard. Just don’t have one too many and peak too early, meaning your whole evening is wasted! There are nice but typically expensive bars in all main squares in Bruges, but some of my favourites are in the smaller squares and streets such as treelined Simon Stevinplein and canalside Huidenvettersplein (Tanners’ Square) where you’ll find slightly cheaper prices. Roughly translated as Sounding Bars, Klinkende Kroegen is a summer music schedule running every Wednesday throughout July and August. Each week a free live performance is arranged by a different band in a different bar between 8pm and midnight. Performances range from songwriters to cover artists, and every genre from Soul to House. The program is published on brugge.be, but the translate function of google may be required. A fairly young event, Moods is another celebration of music in Bruges started in 2014, centering around Burg square. In 2015, there is a free concert in Burg square every Friday and Saturday, and a paid concert (costing 13 euro for presale tickets) in Binnenplein Belfort from 24th July until 6th August. Although open year-round, the views of the Belfry have to be best with the clear skies and warm weather of the summer. Climb the 366 steep steps to the top at 83 meters and then BREATHE and take in the stunning panoramic view. It’s not the worst climb I’ve done, but not the easiest either, and there are a few very narrow points. During summer months the queues will get very long, as only 70 people are allowed up at once, so go early or late in the day to avoid. When we visited the bells very suddenly started playing, making me jump out of my skin! 2015 prices are around 8 euros per person, but are you can get in free if you get a City Card or Museum pass. Bicycle hire is a big business in Bruges, and one of the first things recommended to us the first time we went to Bruges by a regular tourist was cycling to Damme (I’ll never forget him trying to talk to a local woman about it and loudly saying “you know, Dammmnnn- beautiful” in a typical British manner. The local woman had no idea what he was going on about and this lasted for a good few minutes until she finally got it and went “OOohhh, Dah-muh, yes beauuutifuulll little village”. Pronunciation, we learnt, is everything). Start off by making your way to and cycling the vesten- the lovely green outer ringroad which will probably take you past some windmills. This will take you to Dampoort. Follow the signs for traffic to Damme and you’ll find a brilliant flat cyclepath along the canal which will take you straight to Damme. This road is around 4 miles long and on bike should take around 30 minutes to get there. Look out for the trees lining the road, all of which have been bent in exactly the same spot by the wind, then look out for the white Hoeke Windmill- the signal that you’ve arrived! In Damme there are a few small attractions including the Our Lady of Damme church, the town hall or Stadhuis on Kerkstraat with 2 “stones of justice” hung on the wall outside- a punishment tied to the feet or neck of convicted women to carry around the village, and a few nice little bars and restaurants. Once you’ve had lunch and a lovely wander through the pretty streets, take your time to cycle back along the same path back to Bruges. Boat tours in Bruges run from Spring until Autumn, so was something we didn’t get to do on our first couple of visits until we finally went during the summer. Four around 7 euros, you’ll get a lovely relaxing boat cruise around the famous canals of Bruges- “the Venice of the North” (being a Brummie- the city claiming to have more canals than Venice, I actively seek canal trips on all holidays. Okay, that probably has nothing to do with me coming from Birmingham, I just like canals and rivers). The cruise includes a multi-lingual commentary from a live tour guide who points out all of the wonderful sights of the medieval city which can’t be seen from any other means of transport, including the most photographed dog in the world, Fidel (don’t google him, go on the tour and take your own photo!). Definitely worth the fee. That’s all of the summer-exclusive attractions of Bruges that I can think of. Let me know if you have heard of others or discover any of your own and I’ll feature them in the article! Today we’ll be reviewing Straffe Hendrik Wild (2015 Edition) from the Haalve Maan Brewery over in Bruges. It’s a derivative of the Straffe Hendrik Tripel, produced on a limited run, with these ‘Wild’ versions of the popular Tripel first being introduced in April of 2014. Where does the ‘Wild’ tag come from? I’ll quote the Haalve Maan themselves on this…. The traditional tripel beer is re-fermented with a wild Brettanomyces yeast, that creates unusual fruity aromas in harmony with the rich use of aromatic hop varieties. The wild yeasts also provide a longer natural shelf life to the beer and taste developing over the years. Sounds like it might be interesting to follow this review up after giving the beer a year to mature – we’ve put aside a couple of bottles. Abv wise it weighs in at 9%, comes to us in 330ml bottles and has a recommended serving temperature of 6°C (43F). Shelf life is recommended to be no more than 5 years. 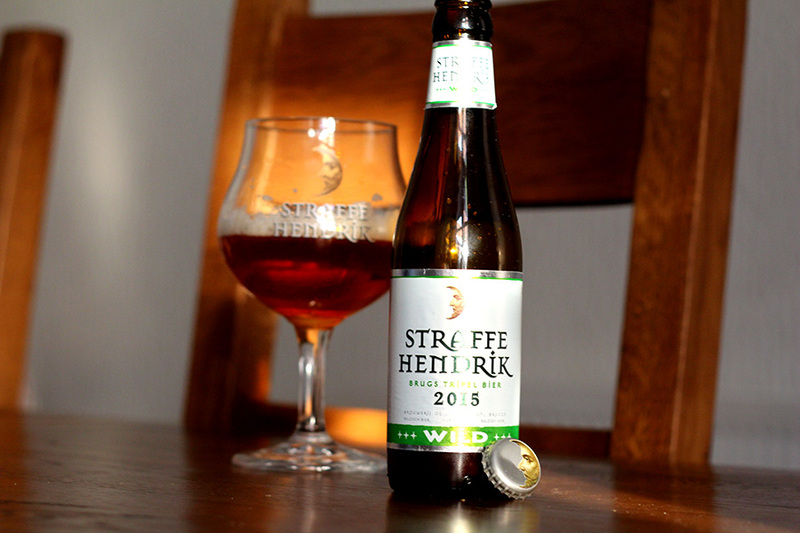 First I’ll talk about the bottle: The Straffe Hendrik range has a fantastic clean modern design – they looks classy, especially the quad, and the Wild is no exception. The white label with brewery logo, distinctive Straffe Hendrik typeface with the highlighted date and then the eye-catching Wild tag around the label base – looks tasty. I pour the 330ml bottle into a Straffe Hendrik glass – colour wise it’s golden, very clear with a nice head and like the label, looks great. It smells fruity to me and I can smell apples and peach – a nice smell indeed. Once the head dissipates a little I give it a taste… It’s quite a bitter taste actually which turns a little sweeter once it lingers. Perhaps it’s the drinking of it on a nice summers day but this really goes down nicely. The finish is dry – I think it’s quite refreshing. To sum up – I like this, I really really like this – everything about it I like – the label, the colour, the aroma the taste. I’m a little annoyed I only bought 4 as I wouldn’t mind putting more of these away for a year to see how it develops with time. This beer is presented in a brown beer bottle with a white label featuring the Halve Maan brewery logo and cheerful green typography. When I poured the Straffe Hendrik Tripel Wild the first thing I said is “wow, what a beautiful colour”. It’s a bright, crisp orangey amber colour with a lovely white head. It’s quite cloudy and makes me feel happy. I’m not one for smelling beers as you might be able to tell from my previous reviews, but this one has a lovely fruity aroma. It makes me want to go and sit outside in the sunshine. The first mouthful of my beer and I’m struck first by a lot of bubbles, so much that it takes a few seconds to pick up any distinct taste at all. Then bitterness sets in on the tongue. It’s not an unpleasant bitterness, but is definitely the main flavour for me. Once that’s died down I’m left with a fruity-coffee taste on my tongue. Again it’s not unpleasant, but not driving me wild either. That fruity-coffee flavour lingers in the back of my throat for quite a while. Once it’s gone my tongue is left excited and a little fizzy, and I’m left wanting more. It seems to bring quite a lot of saliva to my mouth too. The flavour has definitely made a distinct impression on my tongue. I like this beer and appreciate the flavour, but I can think of others I’d go for before. I do really like the branding though and find the bottle one of the most attractive I’ve seen. I much prefer my darker beers. I’d give this beer a decent 6 out of 10. Bruges is a fabulous city for everyone, and there are so many attractions and sights, restaurants and cafes, beers and chocolates that it’s hard to know where to start! Here’s my five favourite places in Bruges, from a woman’s point of view. Soon we should have a his version of the article too. Maybe one day we’ll add a kid’s one! Let me know what your favourite places are too. As cheesy as it sounds, my favourite place in Bruges is nowhere in particular. Just being there, wandering aimlessly. I’ve done it alone, with the hubby and in big crowds. I’ve done it in the sun, the rain, the snow and the wind. In Winter or Summer, morning, day, evening or night. I have never been disappointed. Bruges is beautiful. I can happily just walk through the cobbled streets, looking at the buildings, the canals, the shop displays, the little squares, the markets… Even in winter I will chose to drink outside in a bar just to be in Bruges. I can’t give you an address, or directions. Maybe start at the Grote Markt? Or maybe somewhere else. 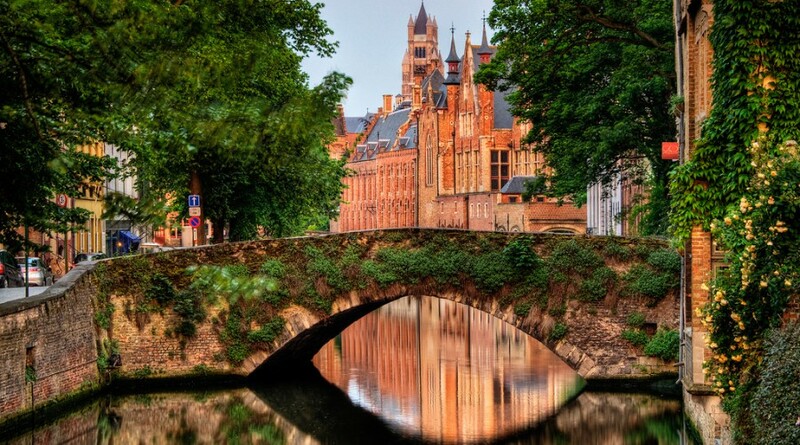 Each day you’re in Bruges, go a different way out of your hotel. Wander. It’s pretty much impossible to get lost in Bruges: so long as you don’t cross the main ring road (you can’t without realising) then you’re never far from the centre. I own an old guidebook of Bruges which I love. I think I picked it up for about a pound in a National Trust bookshop a few years ago. I want to share with you how it starts. I’m not going to comment on it any further because I think it speaks for itself. It speaks right down to my heart, that’s for sure. I went back to Bruges many times, and the beginning of it all was quite simple: I had seen a street in the sunlight. I had stood and watched the golden summer light upon the gables… I had been filled with the light and the warmth and the friendly silence of that street; and I knew that … the street would remain constant to my affection. So I go back to my street in sunlight and in rain. You will not see it mentioned in this little book. If I were to tell you its name, you could find it on the map. But there is no need; for you will find your street, your bridge, your own corner in this town of infinite grace. And that will be your Bruges. -Verkest, M. 1952, New Illustrated Guide to Bruges. Bruges: L. de Reyghere. Every time I go to Bruges I seek this place out- it’s never where I remember so it usually takes a couple of days for me to locate it! The signs outside claim to sell the best hot chocolate in town, Belgium, the world… I guess that’s what first caught my eye about the place. Downstairs is a chocolate shop. It’s not the cheapest chocolate but it is tasty. They have the typical Belgian chocolate models, a range of confectionary, conserves etc as well as a counter where you can choose from a wide variety of bitesize chocolates- building a box of your choice or taking a pre-packed one. It’s upstairs I love though. Up these steep stairs you see a teashop advertised. Up you go, not feeling particularly invited in but usually just desperate for a cuppa or a bite to eat. You’re greeted by two small rooms, about the size of our downstairs lounge, decorated in a sort of shabby chic- possibly more shabby than chic- way. Floral table cloths (but plastic if I remember correctly), framed old photos of random children… its neither particularly beautiful nor particularly ugly. Kinda like your great grandma’s front room if she’d been on lots of travels and picked up one random item on each journey. The menu consists almost entirely of hot drinks and waffles. I think there may be a few other desserts thrown in out of politeness. Don’t be tempted, go straight for the hot chocolates. Again they’re not cheap, but stuff it you’re on holiday, treat yourself to the most expensive one- the one you REALLY want. You have to choose dark, milk or white chocolate. I’ve had all three (not together, I promise!). Genuinely, just go for the one you like the most. The white one is pretty sweet, the dark isn’t too bitter, they’re all yummy. Have a waffle too. Cancel your dinner reservation now while you can still move. Hot chocolate comes served in a HUGE mug of hot milk, with a small plate holding a chocolate “tulip” which holds even more chocolate chips. Go on, eat one. Then chuck the whole lot in your milk- yep the tulip too. Frantically stir and stir until it’s all melted. Then taste. Aaahhhh you suddenly remember why you come back to this place. The waffles are thin- not the American style ones but much much flatter and presented in a flower shape. They’re so light and so tasty you’ll wonder why you ordered those hot cherries and cream (called slagroom by the Belgians, I always find that word funny) but they’re so tasty too you can’t stop eating them. Oh heaven, I’m starting to wish I was there now. So the Old Chocolate House is most definitely one of my top five places to visit in Bruges. Every time I go it is ALWAYS a case of my eyes being larger than my stomach, I can’t help it, but I always leave feeling full and happy. If you fancy visiting the Old Chocolate House (and I’m writing these as much for myself as I am for you- as I said I can never find this place), stand in Grote Markt, in front of the Belfort. Take the road on your right in the corner- not the one which leads behind the Belfort, but perpendicular to it: Steenstraat. This is a busy shopping street so have a mooch in some shops while you walk! Walk through Simon Stevinsplein on your left. Simon Stevinsplein is the former Friday Market of Bruges where the slaughterhouse once stood. Check out the statue of Simon- a celebrated mathemetician- as you pass through the square. The road in the far corner is Mariastraat, where the large Dumon Chocolatier store is on the corner. The Old Chocolate House is on Mariastraat, on your left: “The place to be to drink the best hot-chocolate”, as the canopy says. The first time I went to the Half Moon Brewery in Bruges was on New Year’s Eve 2011-12. We’d booked ourselves on to a tour which was timed to finish at 1.45, 15 minutes before they stopped serving food. It was risky, but our plan was to have a large hearty meal there, then just have street food whenever we were hungry during the evening in order to avoid the excessive prices of restaurants on New Year in Bruges. The tour is great- you book on to a tour in a choice of languages and the tour guide, although clearly not a native English speaker, was fluent and even showed an appreciation for the typical dry sense of humour the Brits of our tour have with a few jokes thrown in for good measure. I think it was the first brewery tour I’d ever been on (having since become quite a brewery connoisseur) and I was really impressed by the interesting information, the friendly group and the enjoyability of it all. I think it was when we booked our tickets a few hours in advance we were first told the view from the top of the brewery was better than the Belfort view. We laughed about it at the time, thinking it was some ridiculous claim to pull the punters in. We were wrong, they were right. I would 100% recommend the view you get from the top of the Brewery during that tour OVER the one you get from the Belfort. And I would not make that claim if I didn’t genuinely mean it. I’m not posting a picture because I want you to go and decide for yourself. Needless to say we both really enjoyed the tour, and the promise of free beer at the end wasn’t one to be ignored. The beer from the Halve Maan is good. The quadruple is very good. Make sure your hotel is within walking distance. What a way to start New Year’s Eve. Having finished the tour and taken our table in the restaurant (a place I at first found uninviting, I don’t know why, I guess it has a bit of a canteen feel about it) they made a point of asking if we were eating- not because they wanted to rush us but because they wanted to make sure they didn’t miss us out. What great service.The food was delicious too. I remember saying half way through “OH MY GOD I’M STILL SO EXCITED BY THIS”. It’s a seasonal menu and pretty much everything contains their own beer. They seemed to have perfected this. We’ve been back to eat a few times since and every time the food has been just as good. I now find the restaurant a lovely place to go- weird how my first impression changed, maybe it has something to do with the beer I know I’ll get soon 😉 To find the Halve Maan stand in Grote Markt, in front of the Belfort. Start off by walking to the Old Chocolate House: the perfect excuse to stop off there for a hot chocolate! Nothing like lining your stomach. Carry on past the Old Chocolate House on your left, following the road to a slight right past the Church of Our Lady and over the pretty bridge. After the bridge take the second road on your right- Walstraat- which will lead you to a small square. Cross the square diagonally and the brewery is right in front of you. Church of our Lady (Onze Lieve Vrouwekerk), Vrouwekerkhof Zuid, Bruges 8000. Saint Salvator’s Cathedral (Sint-Salvatorskathedraal), Sint-Salvatorskoorstraat 8, Bruges 8000. Basilica of the Holy Blood, Burg 13, Bruges 8000. I’m a big fan of churches. That probably sounds weird seeing as I’m not religious in the slightest, but I do like visiting churches and cathedrals wherever I travel- I think it’s the grandeur and the history. Because of this I’ve visited a few of the churches in Bruges, and there are plenty. They can kind of sneak up on you- you’re just wandering along the streets minding your own business when BAM, there’s a massive church in front of you and you wonder how on earth you didn’t see it coming. I’ve written and re-written this part of the article several times as I’ve tried to choose a favourite but it keeps changing and I just CAN’T choose. Therefore I’ve decided my fourth favourite place in Bruges is a church, any church, and I’ll write a little bit about each of the ones I’ve been to. The Church of our Lady, often mistaken as the cathedral of Bruges, is a lovely ornate church dating back to the 13th Century. It’s tower is the tallest structure in Bruges, and is also the second tallest brickwork tower in the world which apparently you can climb although I can’t remember doing so. It is famous for housing many pieces of famous artwork, including a white marble sculpture of the Madonna and Child by Michelangelo. It really is a beautiful and elaborate gothic style church with high vaulted ceilings and dramatic arches which is always busy with tourists and worshippers. To find the Church of our Lady follow the directions to the Halve Maan Brewery above and you’ll come across it just before. Saint Salvator’s Cathedral (also known as Saint Saviour’s) is the main church of Bruges, the oldest parts dating from the 9th Century, although it has been damaged and refurbished a few times throughout the years and so is in the style of 14th Century gothic. This church has a lighter, airier feel than the Church of our Lady. Some people find it bland and cold but I find it calming and relaxing. The pulpit is amazing as is the organ which you can completely miss until you’re on your way out because it’s above the entrance doors. Saint Salvator’s is hugely impressive from the outside, and although some people are disappointed by it’s inside I still find it a beautiful and peaceful church. To find Saint Salvator’s stand in Grote Markt, in front of the Belfort. Take the road in the corner on your right- leading behind the Belfort: Hallestraat. At the bottom of the road turn right onto Oude Burg. Follow the road past the widening of Simon Stevinplein, past Poules Moules and you should spot what could be a church ahead of you. The road changes to Sint-Salvators Koorstraat and all of a sudden you’re there. The Basilica of the Holy Blood is a 12th Century church hiding in the corner of Burg square. I say hiding, there are so many amazing buildings in Burg square it just seems to blend in to the incredible architecture but if you take the time to check it out it really is another beautiful building with these pointed arches above the windows, gold painted statues and what surely must be one of the most ornate facades in Bruges. The lower Saint Basil chapel is a cold, dark Romanesque style brick chapel which is full of atmosphere and is like no other church I have visited. The much more elaborate upper Chapel of the Holy Blood is a complete contrast- with beautiful murals completely covering the walls and ceilings and a beautiful golden altar. You can also view a vial said to contain a cloth with the blood of Jesus, called the Relic of the Precious Blood. It is available to view a couple of times a day so be prepared to come back if you want to see it. From the Belfort, take the perpendicular road to your left: Breidelstraat. This leads to the Burg. The Basilica is tucked away in the corner on your right. Other recommended churches I’ve not been to are Jerusalem Church and Saint Anne’s Church. I kind of have to include this place, it’s a bit spesh to us because it’s where Carl proposed 🙂 but even without that personal reason to visit it’s still a lovely peaceful park and lake. Minnewater is often referred to as the Lake of Love, as “Minne” is the Dutch word for love. This isn’t the real meaning of the word but its still nice, and the area certainly lives up to its pseudonym. Minnewater Lake is a large lake with a small city park located in Southern Bruges close by the the train station. If you arrive in Bruges by train do take the time to take a short diversion through the park instead of following the shortest route into the centre, it’ll add maybe five minutes on to your walk but it’s worth it. In Minnewater you can see beautiful lawns, flowers, plants, surrounding buildings, bridges, swans (a symbol of Bruges) and of course a lovely lake. Following the main paths of the park is pretty, but there are also some beautiful hidden paths and benches which you have to delve a little deeper to discover. The park- and especially the long bridge at it’s end- can get busy during the day but is also pretty and much quieter during the morning or evening. It’s meant to be absolutely beautiful at sunset. From the bridge you get a wonderful view of the Bruges skyline with its towers. At one end of the bridge is the Poertoren (literally the Powder Tower): a small 13th Century tower which was previously used to store gunpowder, a remnant of the old city wall and seen right at the beginning of the film In Bruges. They kept the gunpowder there to scare off any hostile approaches to the city. To get to Minnewater Lake from the Belfort follow the route to the Halve Maan Brewery. Once in the Brewery Square: Walplein; keep pass through it until it thins to a road. At the end of Walplein turn right onto Wijngaardstraat, which widens to a pretty square where there are usually a lot of horse drawn carriages as well as swans. Carry on over the bridge and either take what appears to be a residential alleyway called Minnewater ahead of you (which eventually widens out to a park footpath) or follow the road to the left onto Arsenaalstraat, taking the small pathway on your right just before you cross the water.